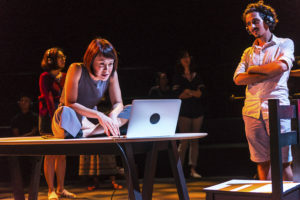 Recently, I caught Loo Zihan’s second iteration of With/Out at Esplanade Studio Theatre. 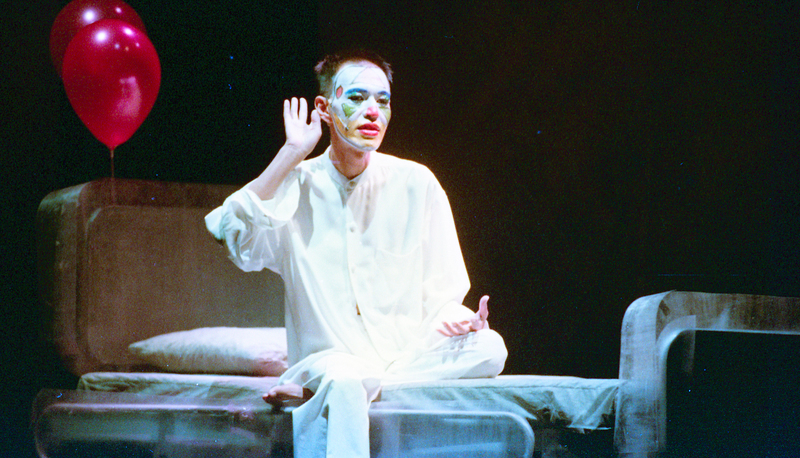 Zihan’s work is an artistic reconstruction and reimagining of The Necessary Stage’s 1999 play, Completely With/Out Character, based on the life of Paddy Chew, the first Singaporean to go public with his HIV status. Completely With/Out Character is a deeply significant work to me. I saw it twice back in 1999, and spoke on a concurrent panel at Action for AIDS, about the production and the questions it raised concerning HIV and AIDS in Singapore. Sixteen years later, in 2015, I was one of the readers in Zihan’s first manifestation of With/Out at Centre 42 under the M1Fringe Festival 2015, of which I was the Artistic Director. It was a Fringe Commission and a Fringe Highlight. 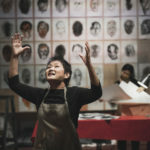 The most recent iteration of With/Out, which I watched this past month at Esplanade Studios, was a performance installation featuring actor Janice Koh. She shared the space with 3 semi-transparent projection screens. 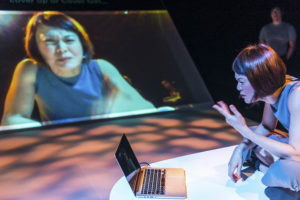 One screen showed archival footage of Paddy’s original 1999 performance, another screened a live feed of Janice in her environment, and the third screen featured archival material from the original 1999 production. 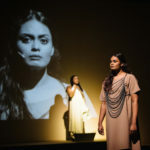 Audiences roamed freely throughout the performance, wearing headsets with a choice of 3 audio channels: Paddy’s performance dialogue, Janice’s performance of Haresh Sharma’s script or a combination of the two. I must acknowledge that I am a longtime fan (and sometimes staff member) of TNS and that I keenly follow Zihan’s work too. Zihan’s practice invites us to consider and question our cultural histories through exhibition, installation and performance. It’s an honour to have witnessed the original work by TNS, and Zihan’s two reconstructions since then. I do believe that in their own right, all three works are landmarks. 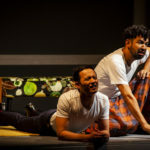 TNS’ Completely With/Out Character was an intensely personal confessional and autobiographical performance; a play that was drawn from Paddy himself, as much as possible in his own words, with carefully restrained dramaturgy by writer Haresh Sharma and director, Alvin Tan. 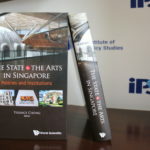 Back in Singapore in 1999, much of the conversation was around whether it could be considered theatre or performance, something we would be less occupied with today. The terminology may not have been in fashion then, but this work had all the hallmarks of Verbatim Theatre. 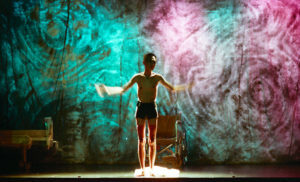 Even the title – Completely With/Out Character – alludes to the membrane of difference between the person, Paddy Chew and the character, Paddy Chew, on stage. 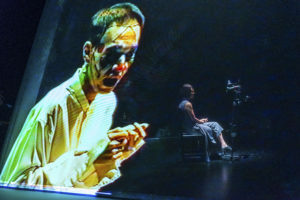 Zihan’s first version of With/Out in 2015 was commendable but did not fully realize the work’s full potential, so there was both boldness and a sensitivity on Esplanade’s part in programming a further development of the work, and on Zihan’s part, for taking it further. It reminds us how vital and bold this work was the first time round. Clearly Zihan revisits Paddy’s story because it’s an important story to relook, and partly because it’s a difficult one to revisit. Each subject and object and each contextual fragment is carefully considered and measured. Having not witnessed the original work by TNS, Zihan undertook the challenge of experiencing it through careful excavation of archival material. He wanted to understand what he had missed, and then see if he could respectfully translate the experience to others who had also missed it. The weight and scale of that undertaking is commendable, as is the original weight and scale of the work by TNS in 1999. Aside from it being a formally groundbreaking piece of theatre, Completely With/Out Character was a work of social activism and education. Almost 20 years after watching it, I recall Paddy’s bravery first. I also think of the self-consciously uncomfortable aesthetic of the piece, and how these reflected the discomfort of the topic, the context, and the collaboration. 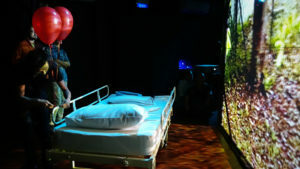 Paddy stood in flippers, rather shoddy clown make-up and hospital garb, in a performative space that was as cold as it was warm, as progressively experimental as it was squeamishly old fashioned and sentimental. Haresh and Alvin were undertaking the daunting task of staging a work with a man critically ill with a disease people were still terrified of. A man who held closely to a faith that was at odds with his journey. I recall the shuddering disruption of the work, when Paddy broke the show in half by announcing a talkback. 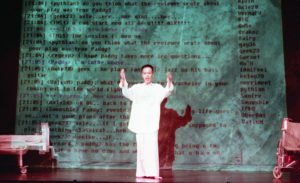 He welcomed the audiences’ thoughts and questions, in the theatre and via ‘live’ IRC chat projected on stage. It was a rare and precious chance to publicly share our thoughts, and hear his responses. This is perhaps the hardest part of the show for Zihan to recall or reimagine into performance. There was a power in facing Paddy in the flesh, with our questions, concerns and doubts, and with whatever affection or disdain we might have carried in our hearts. Watching this latest performance, I thought this section struggled to find its place because it was hard to locate the purpose of the conversation, regardless of how carefully Zihan and Janice tried to frame it. It was the only aspect of Zihan’s latest adaptation that I personally felt had not yet found itself in a convincing, revitalized form. 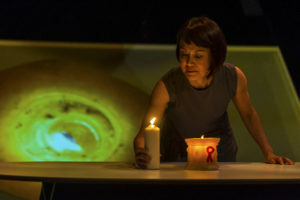 In contrast, the AIDS Candlelight Memorial sequence was strikingly powerful; perhaps more powerful than in previous iterations, perhaps even more so than the original. Why? Because there was a meaningful response from the audience, which swelled without any coercion. 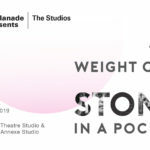 The audience was given space to consider their own response to Paddy, and the questions that come from his life and legacy, as they stepped forward to light candles on a table in the centre of the studio: what this was all about? 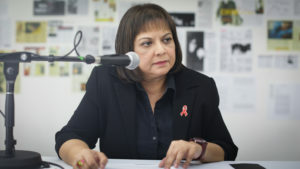 What does HIV and AIDS mean to us now? What can still be done? Was Paddy’s fight worth it? What did his bravery mean to us now? What did his words and his performance mean to us now? These are some of the many important questions we were left free to silently ask ourselves as we stood in somber reverence around the candles. In case it’s not clear to us why Zihan might choose to revisit Paddy’s story, or how delicate such an endeavour is, let me briefly share some perspective. The story of Paddy Chew is a complex one, that comes with great discomfort. It is about death and H.I.V and A.I.D.S, all topics people still prefer to avoid. 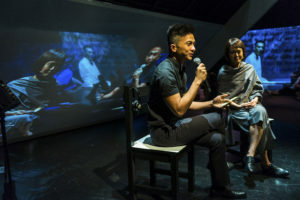 With/Out is about being a gay man in Singapore, which is still taboo. It presents yet another tragic ending to the life of a gay man, encased in the ‘museum of hopeless queer life’, which potentially leads to more negative ‘branding’ than the LGBTQ can handle. Yet, while we have had amazing medical breakthroughs since Paddy’s time, nearly two decades since his performance, few speak of their HIV status publicly out of fear or shame. Many remain ignorant of the condition. So for every reason one might shy away from revisiting Paddy’s story, we are reminded of all the reasons that we should. Whether we look at the work in 1999, 2015 or 2017, I see some common threads. In all of the iterations, Paddy was always presented ‘warts and all’. He was human. He was as brave as he was fearful; as holy and humble as he was bitchy and spoilt; as repentant as he was unapologetic; and as joyful as he was grief stricken. Another thread I see through all versions of the work is that each of them had as few artistic fingerprints on them as possible. Whether it was Alvin and Haresh or Zihan and Janice and their respective collaborators, the dramaturgy sought to present Paddy as artfully as possible, without trying to steal from his raw and unpredictable presence. Every frame and intervention on Zihan’s part attempted to lead us back to the essence of Paddy’s original story and presence, and the original performance he created with TNS. During this most recent performance, Zihan, dressed in black, seemed to deliberately recede into insignificance, no more than a stage-hand working the cameras to capture Janice in her most simple, honest state, as she retells Paddy’s story and shares some of her reflections . Curiously, my only reservation prior to the recent staging was Janice’s participation in the work. I have great respect for her as a person and as an actor but I was unsure what role she might play. 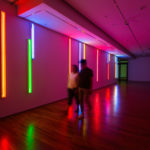 As far as I knew, she had not known Paddy, and I did not know if she had any personal connections to the themes in the work. From experience, I knew that the struggle for Janice was going to be how to strike the balance between distance and involvement. I was one of several readers in the 2015 version of With/Out who read the text ‘live’. 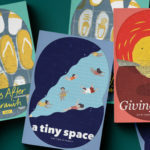 Zihan had also invited Haresh Sharma, Caroline Fernandez, Roger Winder and Laurindo Garcia, all people with a very strong connection to Paddy, to the show or to his story. As someone who felt profoundly connected to Paddy’s original performance, but who did not know him personally, it was difficult for me to find the balance in my reading. I struggled to overcome my sense of inadequacy in representing Paddy’s presence, or the many issues he stood for, and to focus on serving the requirements of the task: to simply read, and trust Zihan’s design of the overall performance and installation. While I believe that some found Janice’s presence to be an obstacle to their experience, her performance worked for me quite profoundly. I thought she struck a careful balance between restraint and release. There were extended moments of stillness and listening, alongside hearty and sincere sharing (Janice’s own words based on her own experiences of researching for the project). There was carefully nuanced storytelling, utilising Haresh’s official text of Completely With/Out Character, which Paddy would depart from each time he performed, as he was free to do. Janice was our everyman, a medium of sorts through which we all reverently tried to connect back to Paddy. Persisting with these reimaginings of Paddy’s performance is not without its risks for Zihan as an artist. His reconstructions of archival works are met with as many folded arms and rolling eyes as they are with enthusiastically open arms. It is not uncommon to hear reservations about his artistic preoccupations, along the lines of, ‘when is Zihan going to take his artistic questioning beyond the trajectories of others, and into his own?’ Zihan acknowledges these surrounding tensions and views, but persists. For With/Out, he might also be criticized for reinforcing negative views of the queer community, not adequately representing HIV and AIDS issues; and for generating yet more queer sentimentality and cripplingly nostalgic queer melancholia. And if those are not enough burdens or sensitivities weighing on the project, we must also address the fact that Paddy is of course deceased and we continue to summon his ghost on stage, allowing him to haunt us. That is potentially problematic. I personally admire Zihan for mindfully putting such cynicism aside. I appreciate the discipline and sensitivity in Zihan’s approach and the way he continues to ensure that the original work, in all its fragility and potency, remains as much in the forefront as possible. I admire the fact that instead of walking away from his occupation with capturing histories in aesthetic and performative spaces, he takes it head on, with a range of critical perspectives in mind and significantly considered intellectual distance. Zihan brings history to the present, welcoming us to access it freely, from a great range of perspectives. We are reminded that all experiences are personal and are personally constructed and subjectively received. Just as we chose our own audio channel, our own position in the room. Just as we chose to interact in the talkback or not. To light a candle or not. To watch Paddy or watch Janice. To watch Janice live, or Janice on live feed. Or to look away and close our eyes and just listen. We were free to sit in the brightest light or hide in the darkest corner, whether with tears or with laughter. And there was much of both. In this living museum of queer life and death, Zihan succeeded in connecting us with a bittersweet story that still lives on. In the story telling there was bravery, boldness, kindness, mercy, acceptance and self-acceptance. For every strain of sadness captured and released that night, the aesthetic space established in the studio was also a balm for our sorrow and disappointment. This was no pity party. It was a ritual to help us consider our mortality, our morality, our history and our humanity. At a time when we need to listen to each other more than ever, this work invites us to do just that. Listen. Guest contributor, Sean Tobin hails from West Australia and holds a Bachelor of Education (Drama) from Edith Cowan University. He has over 20 years experience working in Theatre and Education. In addition to heading drama departments in schools in West Australia, Sean also has over 15 years experience in the Singapore theatre and education circles as a teacher, performer, writer, director, consultant and festival director, since he first arrived here in 1993. He has worked full time with Act 3 International, TOUCH Arts and The Necessary Stage and was formerly the Artistic Director of the M1 Youth Connection. Sean has also conceptualised and directed well-regarded productions such as Close – In My Face, Sing Song, Tongues, The Perfection of 10 and Body of Land. 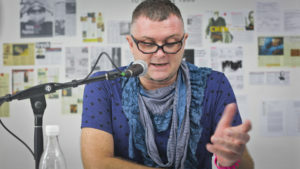 Sean is currently the Artistic Director of the M1 Singapore Fringe Festival and Heads the Theatre Faculty at School of the Arts, Singapore.